Jefferson County Public Library (JCPL) develops and maintains a materials collection that reflects the changing needs and interests of our community. The purpose of this policy is to guide selection practices to ensure that a wide variety of materials is available in our libraries in formats and quantities that meet the needs of our residents and patrons. Our values of innovation, accountability, and flexibility will be demonstrated in our approach to implementing this policy. We will use data, community feedback, and our expertise in order to create the best collection of materials possible for the residents of Jefferson County. The Collection Development policy for Jefferson County Public Library supports the library’s Vision, Mission and Values. Vision: Jefferson County Public Library will be the essential destination where all generations connect, discover and create. Mission: Jefferson County Public Library helps to build an educated and vibrant community by providing equal access to information and opportunities. Values: Jefferson County Public Library will uphold our core Values of Innovation, Accountability and Excellence. To these ends, the collection at JCPL will reflect the interests of our community. JCPL recognizes that it is impossible to collect all that is published. Physical space and a finite budget will limit what we can purchase for the residents of Jefferson County. JCPL will curate the selection of the best, high interest and useful materials in a variety of formats. JCPL regards its collection as one shared collection, distributed between its various locations and created to build an educated and vibrant community. All libraries will have high interest materials in various formats supporting all areas of the collection. The percentage of each part of the collection will vary by location. 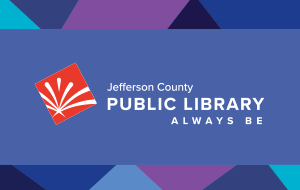 JCPL has different sized libraries from small neighborhood locations to shared spaces to large, more centrally located sites within the library service areas that make up Jefferson County. Due to size and space limitations the variety of materials available at each location will differ. JCPL’s collection as a whole will have a wide variety of materials from the highest interest to older titles with lasting value. All locations will not have the full depth of the collection in their building, but all materials are available to all residents across the county. Smaller locations will have a collection that consists primarily of high interest circulating materials. Medium-sized locations will have a collection that consists primarily of high interest circulating materials with the addition of more mid-range authors, titles and subject areas. Larger-sized locations will have the full depth of the collection that consists of high interest circulating materials with the addition of a wider range of authors, titles and subject areas, including older titles with lasting value. Jefferson County Public Library through its governing body entrusts the selection, curation and evaluation of materials in its collection to designated staff members in our Collection Services unit. Staff will use the Collection Development Policy along with their training, expertise and professional tools in the selection of materials in all formats. JCPL will make every effort in their selection of materials to provide a balanced collection representing diverse viewpoints and interests. All patrons and staff are encouraged to recommend titles for inclusion into the collection. Jefferson County Public Library seeks to develop and curate an outstanding collection that will fulfill the educational, informational, and recreational needs of the residents of Jefferson County. Customer use and circulation data are the most powerful influence on what we select and retain in our collection. This data, combined with such factors as author reputation, accuracy of content, currency and lasting value, guide our selection and deselection decisions. In addition we always seek to provide materials reflecting a variety of perspectives, beliefs and needs. Not all the criteria listed must be met to select an item for the collection and no one criterion will be the deciding factor. Materials purchased for the collection are not an endorsement by JCPL of either the content or of the authors’ viewpoints. The number of copies purchased of a title varies with the interest in that title. Individual titles are monitored and additional copies may be purchased to meet demand. Relevant to the needs, interests and demand of the community. High interest to the general Jefferson County population. Lasting value to the community. Author reputation and/or authority in the field. Older materials of lasting value; replaced as needed based on patron demand and use. Artistic merit, literary value or recognized award recipient. Availability online to the general public. Format, suitability of the physical format for library shelving and circulation or durability/quality of the format. Ease of access for electronic formats. Scholarly and/or technical materials suitable for academic and/or special libraries. Puzzle, pop-up, workbooks, items with dangling pieces, etc. Materials publicized exclusively through infomercials and personal websites. Self-published materials that do not fit the library’s collection or selection criteria. We encourage Jefferson County residents to participate in the collection development process so we can build a collection that accurately reflects the needs and interests of the County. The library provides a venue for residents to suggest titles for purchase. All suggestions will be reviewed using the criteria outlined above. For items not purchased, residents will have the option to request them through our resource sharing partners or through JCPL’s Interlibrary Loan service. Collection maintenance is as important in maintaining a relevant collection as the selection of new materials. The library’s collection is under constant review in order to maintain relevancy, community interest and physical condition. To determine retention or withdrawal, staff uses the following criteria based on standard library weeding philosophy. Condition: worn, water damaged, chewed, stained, ripped, mildewed, defaced, etc. To create shelf and display space for newer materials. Withdrawn materials are repurposed: resold, recycled or put to other uses. The criterion for material selection and deselection also applies to gifts, donations and memorials. Once a gift or item is accepted by JCPL it becomes the property of the library unconditionally. JCPL will make the final decision on acceptance, use or disposition. Gift materials not added to the collection will be repurposed, resold, recycled or put to other uses. Any author or publisher that contacts JCPL directly to promote their material for inclusion in our collection will be directed to the Jefferson County Public Library Purchasing Guidelines for Authors. Memorials are created when money is donated to add books or other materials to the collection. JCPL welcomes suggestions for purchases but reserves the right to make the final decision regarding all materials added to our library collection. Memorial plates may be added to the items purchased. Jefferson County Public Library will purchase and maintain materials on the history of Jefferson County and Colorado that are of broad appeal and that will be part of our regular collection. Archival materials, special collections, municipal collections and materials that require special handling will not be purchased to be part of JCPL's collection. JCPL will provide government documents for our residents that contain information concerning upcoming projects such as highway construction, environmental impact studies, special community meetings, and those required by statute. These types of materials will be held locally for the specified duration of the project and/or evaluation period. Government documents of lasting value, such as flood plain information, will be cataloged. Any individual, municipality or group that would like to donate special, archival or historical material to JCPL will be referred to existing local historical societies, archives or museums. If there are no existing resources we will refer them to the Jefferson County Archivesopens a new window or to Denver Public Library's Western History departmentopens a new window. Jefferson County Public Library fully supports and believes in the freedom of information for all and therefore does not practice censorship. JCPL does not endorse particular beliefs or views expressed in the materials selected. Selection of an item does not imply JCPL’s endorsement of the viewpoints expressed. Materials may be controversial and any given item may offend some person. The selection of material is not made on the basis of anticipated approval or disapproval. It is the merits of the materials along with the collection needs that drive selection. Materials may be excluded from the collection according to our General Selection Criteria. The library’s selection decisions are not influenced by the possibility that materials may be accessible to minors. Materials may contain mature content, questionable and/or coarse language and different viewpoints. Comments from patrons concerning JCPL’s collection are welcome. Both formal and informal processes are in place to address concerns about specific materials selected for the JCPL collection.